When the checkered flag dropped as Brad Keselowski crossed the finish line to win the 2014 Kobalt 400 last March, the green flag dropped on the staff at Las Vegas Motor Speedway to start planning this year’s NASCAR Weekend. In fact, while stock cars were racing around the 1.5-mile superspeedway at more than 150 mph, NASCAR fans in attendance were offered special deals to buy tickets for the 2015 events, March 6-8. The weekend includes the Stratosphere Pole Day, Boyd Gaming 300 NASCAR Xfinity Series races and the Kobalt 400 NASCAR Sprint Cup Series race. 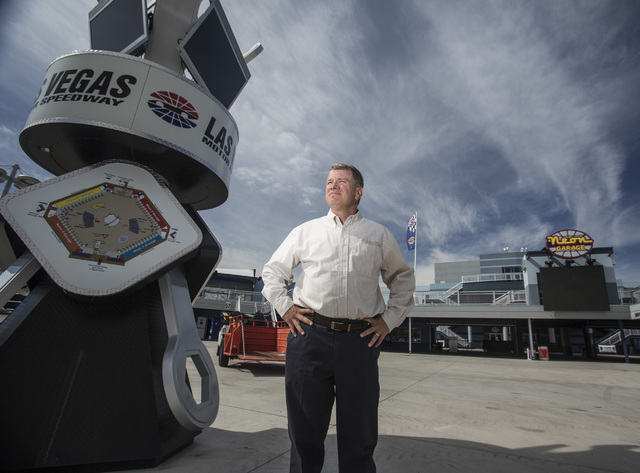 “It’s a tremendous undertaking,” said Chris Powell, president and general manager of Las Vegas Motor Speedway. “We plan the actual event and marketing through the course of 51 weeks to get ready for NASCAR Weekend. We start marketing during the previous year’s events by offering tickets for sale. People who renew their tickets are given a … gift that has significant value — something along the lines of a tool kit. And all of those NASCAR fans have a huge economic impact on Las Vegas. The Las Vegas Convention and Visitors Authority said the event attracts more than 150,000 visiting fans and generates more than $146 million in nongaming economic impact for Southern Nevada. NASCAR Weekend also puts locals to work. Powell said the speedway hires 2,000-3,000 part-time workers for the event. Openings are for everything from security to concession workers, ushers to gate attendants and traffic coordinators. For NASCAR fans, the biggest draw might be the Neon Garage, which provides unprecedented access to race teams and drivers, unique concession areas, live entertainment and the Winner’s Circle, according to the speedway’s website. The Neon Garage allows race fans to watch the drivers and crews of the NASCAR Sprint Cup Series from both ground level and elevated positions. An event this size can be a logistical nightmare. Last year, thousands of fans who had parked in a free parking area were not allowed to leave until the paid parking lots had emptied, by some estimates an hour after the race. Powell said at the time it was a mistake to lock the gate and apologized. Getting the message of all the events during NASCAR Weekend out to the fans is a challenging process, even though race fans are technologically sophisticated. Powell said Las Vegas Motor Speedway takes a multipronged approach by using various social media websites, including Facebook, Twitter and Instagram, where fans receive notices about the event. In addition, the track uses traditional advertising venues, such as radio, TV, newspaper and outdoor advertising. While NASCAR Weekend and the Kobalt 400 have large national sponsors, they also have local companies signed on as sponsors. The Stratosphere sponsors Pole Day on Friday, where drivers take to the track to determine starting positions for the races. Boyd Gaming sponsors the Boyd Gaming 300 NASCAR Xfinity Series race.